Nevada Outdoors is a family owned and operated landscaping and lawn maintenance company. Founded in 1979 and now operated by Deven Peterson, we have been keeping Nevada green for over 30 years. Being fully licensed and bonded, you can be sure that you’re working with professionals when you call Nevada Outdoors. Our A+ Better Business Bureau speaks for itself and the ever-growing list of customer testimonials will show you just how much care we put in to our work. Over the years we have developed a team of professionals that carry on the family’s commitment to quality and service. 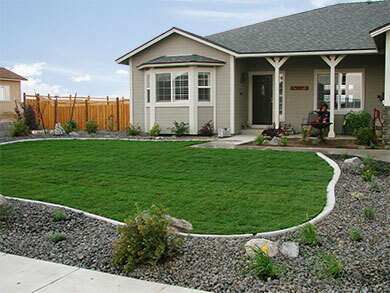 From lawn care to landscaping design, each aspect of your project will be handled with friendly and personal service. Many of our customers are homeowners who have worked with other landscape designers and lawn care companies before finding us as making us their long-term partner. Many of our customers are businesses that have found our professional service to be the answer to years of frustration with other landscape companies. Please take a look at our photos, browse our list of services, and then contact us today. Give us the opportunity to show you what sets Nevada Outdoors apart. You'll be glad you did! They were very professional and friendly, show up on time and finished when they said they would, I will use them again for my next project and have already recommended them to my neighbors.